See and Feel the Difference Today! Trace minerals are a missing nutrients in oour diet and these deficiencies can the strength of our skin, nails and hair. Plant based minerals are superior - 15,000 times smaller than non-plant minerals, much more easily absorbed and even used by your body at the genetic level. Essential for protein metabolism Without trace minerals, the enzymes you need for metabolism and digestion are paralyzed and your health and appearance suffers. 30 day (1 month) supply. That’s only 48 cents per serving. If you get autoship (monthly shipped), it’s only 42 cents per serving. If you want to look your best, you're probably using special creams, tonics and shampoos to improve your skin, hair and nails.But they rarely work as well as you dreamed they would. That's because problem with your skin, hair and nails are often due to deficiencies in trace minerals. If you don't have enough of these beauty essentials, your body can't activate enzymes needed for healthy hair, skin, and nails. So even if you're eating enough protein your body can't use the protein it needs for you to look your best. Lets face it, your hair is your crowning glory... but only if it looks great! When your nails are naturally strong and long, they don't chip or become brittle. The secret to aging gracefully is to keep the underlying collagen layer in your skin plumpped up so you don't look drained. All of this is possible when your body gets enough trace minerals. And that's how getting enough trace minerals builds beauty from the inside out. It's is the little known secret to looking amazing right now and for the rest of your life! Get enough trace minerals for thicker, shinier and healthier hair! By properly metabolizing protein you'll promote stronger nails! Supporting your skin's collagen layer makes skin appear plumper and younger! Trace minerals are often a key component of enzymes for healthy digestion! Get enough trace minerals to help your body support your DNA! Get rid of trace minerals deficiencies that can cause crazy food cravings! 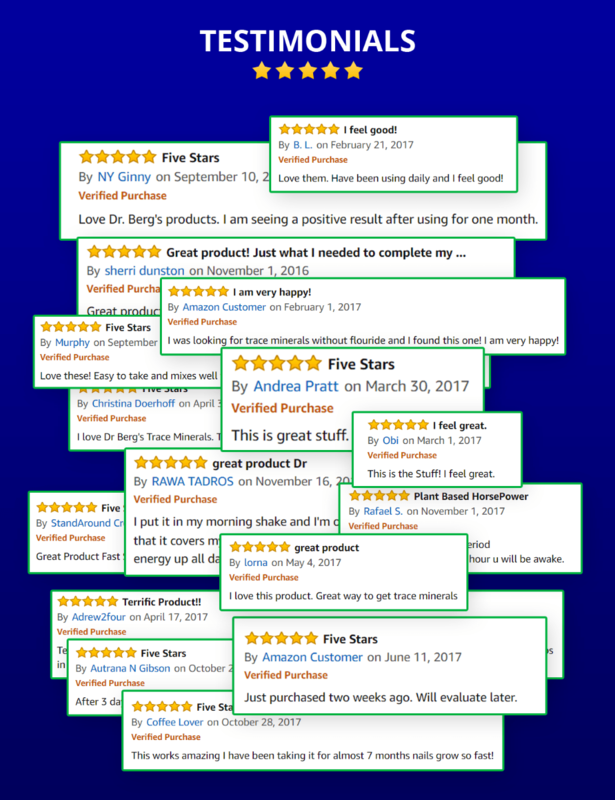 Feel the difference when you replace missing key ingredients for your health! Boost skin, nail and hair health with 100% plant based trace minerals for fast 'rocket-ship' absorption. Specially extracted trace minerals from the prehistoric time period over 70 million years ago when the soils were extremely rich. Activate previously dormant chemical and metabolic reactions in your body to support overall health. Activate enzymes to promote healthy digestion. Support a comman nutrient deficiencies in your diet. Why? Because over the years, our soils have become more and more depleted. If the soil is missing the nutrient, the plant will also be deficient. From 1965 to present, some trace minerals have been depleted by 6x. The basic minerals farmers put back in the soil are nitrogen, potassium and phosphorus that it, three! We need all 70+ trace minerals. Your body is built from these minerals and they are the building-blocks of health. They are minerals that are needed in small amounts, usually fewer than 100 milligrams. Yet, they are still needed and required. The problem is we had not done enough research on trace minerals to demand farmers to put these back in. Are all Trace Minerals the Same? Absolutely not! There are 2 main kinds of minerals. Minerals that are rocks or salt and minerals which are plant-based. In nature, the rocks in our soils breakdown for the plants to absorb them from the earth to become a different type of mineral. Plant-based minerals have much less tighter bonds that rocks, so they are very easily absorbed by our bodies. In fact, plant-based minerals are 10,000 times smaller than rock minerals. The technical terms for these weaker bonds (in plant minerals) is called covalent bonds look it up in your spare time. The technical term for rock minerals are inorganic and the term for plant-based minerals are called organic. This is different than the other meaning for organic meaning without pesticides. Organic minerals mean plant based minerals. It is very difficult to find high quality plant based minerals, go ahead and try it next to impossible. Most trace minerals sold today are from sea salt, which are only between 4-8% absorbed. Why is it Difficult to Find Plant Based Minerals? Where are we going to get them? Our soils are depleted. There are still parts of the world that we can find good soils, but we don’t want to consume the soil directly, we want to consume the plants grown on the soil. Where Did you Find your Trace Minerals? We used a company which extracted their trace minerals from the prehistoric plant-life which occurred over a period 70 million years ago, when the soils were extremely rich in minerals. Then we liquefied them using cold-water extraction. How Can Trace Minerals Affect Our Bodies? And the food is only as healthy as the soil it is grown on! Even if you eat the most perfect diet loaded with fruits and vegetables and healthy protein, you may be deficient in trace minerals. Why? Because over the years our soils have become more and more depleted by mass farming. Since 1965, some trace minerals have been depleted by SIX TIMES what they were. That means you’d have to eat 6 oranges today to get the same amount in 1 orange in 1965. Farmers today put back only three minerals into the soil: nitrogen, potassium and phosphorus. But we need all 70+ trace minerals. Your body is built from these minerals and they are the building blocks of health. 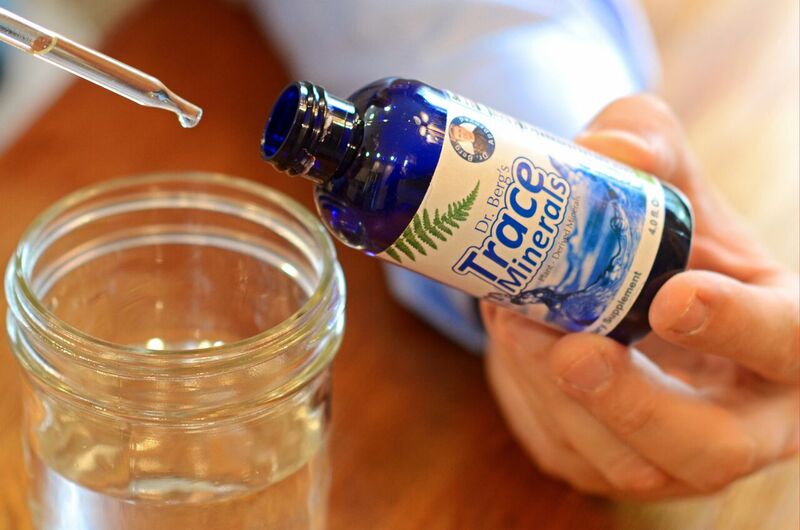 Replenishing trace minerals is easy when you take 1 dropper of Dr. Berg’s Trace Mineral Formula in water each day. Dr. Berg’s Trace Minerals help support the normal balance of trace minerals to your body, ensuring your body gets what it needs, and greatly impacting your hair, skin and nails. Feel and see the difference today! How to Look and Feel Great RIGHT NOW! Where did Dr. Berg Trace Minerals come from? These minerals have been extracted from a layer of the earth created from prehistoric plants in the Sedona time period (70 million years ago). For some reason they did not become oil like most other ancient plants. The soils back then were rich in trace minerals. Is there any scientific research on trace mineral deficiencies? Definitely. In one study, it was found that the top diets are severely deficient in trace minerals because they reduce your calories, which automatically reduce your nutrients. It was found that due to our poor soils in the US, it would take 27,000 calories of food to get the required trace minerals you need. In another study, it showed that trace minerals are required for your metabolism to work correctly and this has created problems for our growing kids. How many drops do I need per day? The label reads 1 teaspoon or 40 drops (2 Full droppers) per Day, anytime in water. How do trace minerals work in the body? They are required nutrients in all body cells including our DNA. They are also needed in enzyme interactions, which are required in building proteins like in nails, hair, muscles, bone, connective tissues, organs, hormones, glands and metabolism. They are also important in the detoxification process. Trace minerals are the least understood by the medical community, yet they are the most important part of nutrition. They are especially important in a growing fetus and infant, yet baby food only contains a fraction of these trace minerals and in the form that is NOT plant based, only rock or metallic form. How deficient are our soils in trace minerals? From 100 years ago, many of these trace minerals are at least 70% missing. However back 50 years ago, it was not known that our bodies required trace minerals, so less attention was put in ensuring they are in our soil. Put them into a glass of water and drink away. You can also put them into other forms of liquids too. It does not matter when you take them take anytime of the day. However if you take them directly in your mouth without putting them into water, theye a bit concentrated, so dilute them with water. 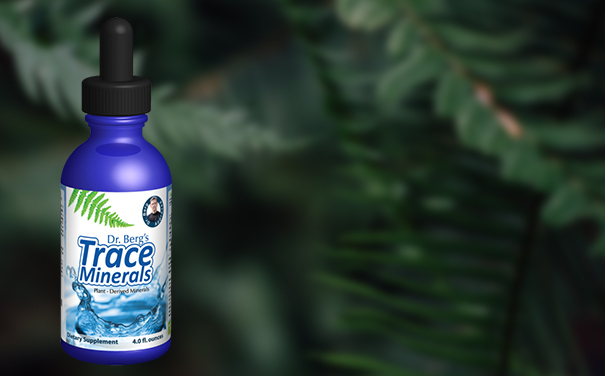 What so special about Dr. Berg Trace Minerals? They were created 70 million years ago in prehistoric times. They are plant based minerals, not salt or metallic rocks. This means the absorption is 100%. This is because they are 10,000 smaller. To put this into perspective, if you had a golf ball sitting next to the empire state building, you would see the difference between plant based minerals versus other trace minerals sold (rocks or sea salt based). Trace minerals work on the cellular level. They are not quick reacting drugs or stimulatory like some energy drink. They provide the missing building blocks to slowly repair and build your body tissues. Because our bodies are so different, depending on what you have been missing, the results are so wide in its effects. Some people are very deficient in zinc, yet others cobalt. Within a few days, you may feel more energy, more satisfied with foods (fewer cravings). Interestingly, I have noticed more muscle strength like my connective tissue and muscles feel younger and stronger. I feel more calm and relaxed like my body is finally is getting what it been missing for 47 years better late than never. No these are necessary nutrients that your body requires, not just something nice to take. They are not just another anti-oxidant or phytonutrient. They are basic require nutrients that were supposed to be in our foods. How many minerals are present? Are they in an alcohol base? No, they are in purified water. Do they have to be taken with food or on an empty stomach? Any time it doesn matter with or without food. Can Trace Minerals be used to mineralize your water? Yes, put 4 drops per gallon.